Urtez Urte Erosahalmena Galtzen -- Asociación Española De Banca -- ELA Euskal Sindikatua -- Bankan Ere Euskal Komenioa Ren Alde! 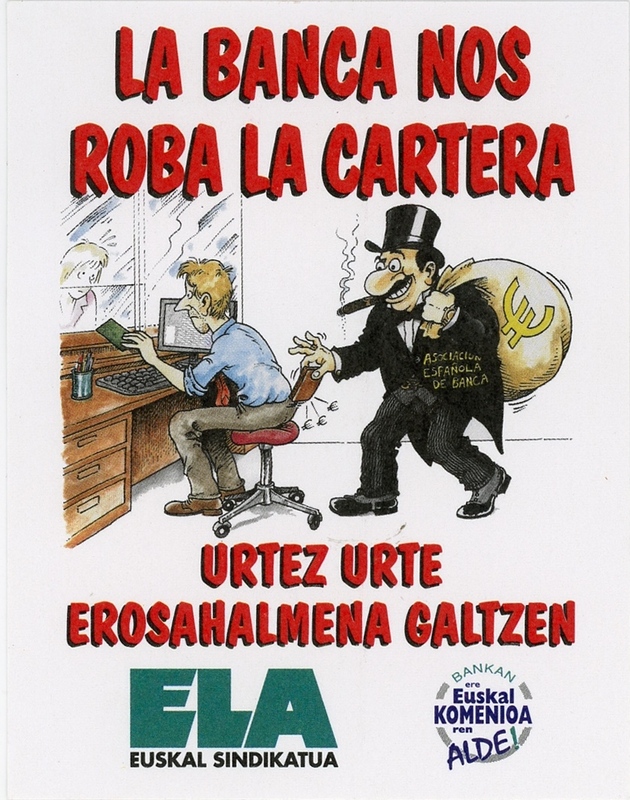 The Bank Robs Us From Our Wallets -- Loss Of Purchasing Power Over The Years -- Association Of The Spanish Bank -- ELA Basque Country Union -- The Bank Is Also In Favor Of The Agreement! This sticker shows a man dressed in a black top hat and tuxedo with a tail smoking a large cigar. On his coat pocket reads, "Association Of The Spanish Bank," showing that he represents the Banks. He has a tan sack draped over his left shoulder with the euro symbol on it. The sack appears pretty full. The man is reaching forward towards the man infront of him who is sitting at a computer station talking with a customer. The Spanish Bank man is robbing the employee from behind, stealing his wallet out of his pocket that clearly has euros in it. This sticker came out around beginning of the bank corruption that is still taking place in Spain today. This corruption and fraud that took place eventually led into Spain's economic crisis beginning in 2008, which then created the 15M or Indignados Movement in Spain.